EXECUTIVE SUMMARY: Israel has a natural right to, and an internationally recognized need for, defensible borders. The Jordan Valley is the only truly defensible eastern border for Israel. UN Security Council Resolution 242 of November 1967 stated that Israel must have “secured and recognized boundaries” – borders that are not necessarily identical to the indefensible lines that preceded the war. The resolution did not demand that the IDF retreat completely to the 1947 lines. Even back then it was understood that the 1967 lines were too tempting to Israel’s enemies. In 2004, the United States gave Israel a letter of guarantee that recognized Israel’s right to “defensible borders that would allow it to defend itself by itself.” This document was signed by President George W. Bush and backed by a bi-partisan majority in the American Congress. As we seek to determine the location of these defensible borders for Israel, we must take into account two main factors, with a long-term and historic perspective. First, we have to consider the threats to Israel – conventional warfare, missiles and rockets, terrorism, nuclear weapons. Second, we have to consider the geo-strategic and the topographic situation. The State of Israel is by no means a weak nation, but it is vulnerable because it is small and narrow. Seventy percent of its population and 80 percent of its industrial capacity is concentrated in the narrow coastal strip between the Mediterranean Sea and the West Bank. The hills of the West Bank topographically dominate the exposed coastal plain, which contains a significant share of Israel’s national infrastructures, including: Ben-Gurion International Airport, the Trans-Israel Highway (Road 6), Israel’s National Water Carrier, its main high-voltage electric power lines, and more. This topography gives a distinct advantage to any attacker in terms of observation, firepower, and good defensive capability against an Israeli ground response. These reasons led the architects of Israel’s national security doctrine, from Yigal Alon and Moshe Dayan to Yitzhak Rabin, to tenaciously oppose Israel’s return to the vulnerable 1967 lines; which, they believed, would only invite aggression and endanger the future of Israel rather than pave a path towards peace. Many years have passed and the need for defensible borders has only increased. Indeed, the history of Arab aggression against Israel and chronic instability in the Middle East has recently been compounded by a number of significant developments. The “Arab Spring” or ‘uprising’ has led to civil wars and unprecedented bloodshed, increased terrorism, and even introduced global jihadist terror to the Middle East. This threatens regimes and reinforces the region’s fundamental uncertainty. Iran is doggedly moving towards nuclear weapons, and is aggressively involved in every conflict in the region; establishing “outposts” in neighboring countries. Never-ending terrorism is on the rise, and its effectiveness has grown with the development of terror-by-rocket. The involvement of terrorist organizations in regime struggles, the introduction into the region of global jihadist terrorism and Iran’s involvement have made terrorism a strategic threat that could lead to war in the region. Renewed efforts to bring the Israeli-Palestinian conflict to a peaceful resolution places the issue of borders on the negotiating table and puts it at the forefront of the core issues under dispute. Defensible borders for Israel must meet the following criteria: Fundamental strategic depth; room to wage war against the threat of conventional attack from the outside; and room that allows for effectively combating terrorism. In the south of Israel (with the demilitarization in Sinai) and in the north (given that Israel has held onto the Golan Heights), Israel has defensible borders. What is the meaning of the criteria for defensible borders on the eastern front? First, Israel requires fundamental strategic depth, whose importance only increases in the age of ballistic missiles and long-range rockets – which threaten civilian population centers and even impact upon military recruitment and the deployment of reserve forces. Under these conditions IDF ground units will be forced to operate for long periods of time without significant assistance from the Israeli Air Force. The air force will be busy achieving air superiority through destroying enemy air defenses and suppressing the launching of ballistic missiles and rockets aimed at Israel’s cities. In addition, the threat of nuclear arms in the region reinforces the need for a strategic depth required to deploy early warning and interception systems. Second, Israel needs depth to wage defensive war against the threats from conventional attack from the east. Uncertainty and concern regarding the directions in which Iraq and Jordan may develop, and civil war in Syria that threatens to spill over to its neighbors, makes this depth critical. Third, Israel must retain room to fight terrorism effectively. Only Israel’s presence on the outer eastern border of the West Bank (the Jordan River and Valley) will enable genuine demilitarization of the Palestinian Authority, which is a condition for any stable arrangement and one of Israel’s fundamental conditions for agreeing to a two state solution. 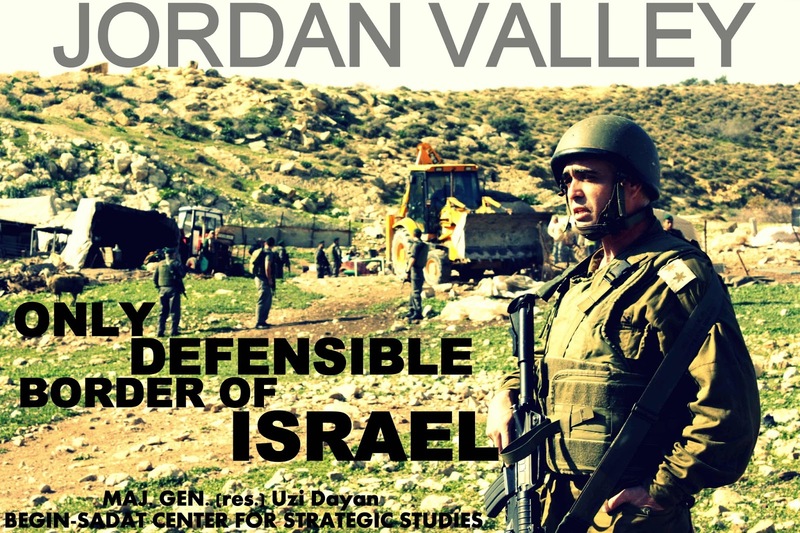 Thus Israel’s only possible defensible border is in the Jordan Valley! It is important to remember that Israel is on average only 40 miles wide from the Mediterranean Sea to the Jordan River. This is, in all opinions, the minimal strategic depth and indivisible air space. The width of the Jordan Rift Valley ranges between 6.7 and 14.5 km. The Jordan River flows at an altitude of some 400 meters below sea level, and to the west is a ridge of mountains rising up to a height of up to more than 1,000 meters above sea level. Thus, the Jordan Valley is a physical defensive barrier with a height of 900 to 1,400 meters, which is traversable only by five essential mountain passes. Therefore, even the limited force of the IDF standing army should be able to successfully defend Israel against an attack from the east as long as it is deployed in the Jordan Valley and on the ridges that control it from the west. The Jordan Valley is the eastern buffer zone surrounding the State of Israel in general and the city of Jerusalem, its capital, in particular. Experience from Israel’s withdrawal from southern Lebanon and Gaza has taught us that if Israel fails to control the buffer zone, the entire area we withdraw from will become a terrorist entity. And it is important to note that the Jordan Valley is an arid region with very little Palestinian population. There are those who would attempt to dispute this security statement by proposing the placement of early detection systems in the Jordan Valley backed by the deployment of foreign forces. However, experience proves that no warning system can replace the defensive space of the Jordan Valley, and that Israel must not rely on foreign forces for the combat of terrorism nor as a defensive force. Foreign troops will not risk their lives for the war on terror and they will be the first ones to leave should a crisis arise. Only Israeli forces can provide the security Israel needs. Consequently, Israel must move from a policy of “security based on international agreements and diplomatic guarantees” to a policy of “agreements based on security provided by Israeli forces deployed in defensible spaces.” Neither the Green Line nor the Security Fence can serve as Israel’s defensible border. Only full Israeli control of the entire Jordan Valley region as a security area, based on the Jordan River as a boundary line, will be able to provide Israel with sufficient security. Defensible borders will not only ensure Israel’s security needs but will also guarantee that peace treaties are sustainable. Maj. Gen. (res.) Uzi Dayan was head of the IDF Central Command, IDF Deputy Chief of Staff, and National Security Adviser to the Prime Minister of Israel. He currently heads Israel’s National Lottery Corporation. This paper is based on his remarks at a March 27 BESA Center conference on the negotiations with the Palestinians.